Only 30 Available at this price! The Dexter S122PCP Sani-Safe® oyster knife features a 4-inch blade that is durable enough to cut meat out of an oyster. With its DEXSTEEL™ construction, the blade is made of high-carbon steel for strength and maintains its shape. The space between the blade and handle is sealed to prevent food and liquid from getting trapped there and promoting harmful bacterial growth. The Dexter S122PCP Sani-Safe oyster knife's blade is long and narrow, allowing it to open a variety of oysters. Its polypropylene handle is easy to clean and resistant to extreme temperatures. Sani - Safe 4" Oyster Knife, Boston pattern, stain - free, high - carbon steel blade, textured, polypropylene handle, NSF certified. 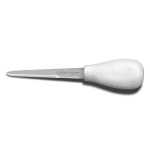 "Great for opening smaller oysters. Works Great"
"Very durable handle and construction"